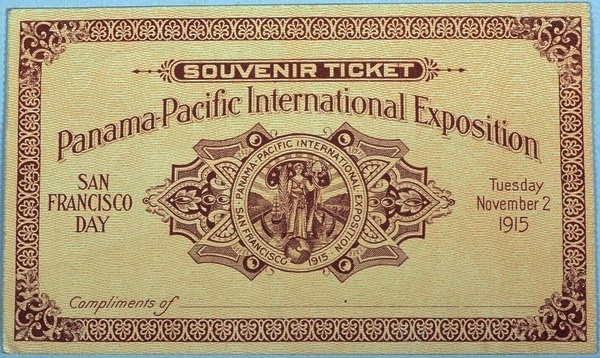 This is the center portion, a souvenir stub now, but when purchased and presented for admission, it would have had an "I PAID" portion on one end and an "Exhibitors Gift Coupon" on the other. Still, this is a very nice souvenir which isn't seen for sale very often. The Palace of Fine Arts appears on the front of this souvenir ticket. For a time the Palace housed a continuous art exhibit, and during the Great Depression, W.P.A. artists were commissioned to replace the decayed Robert Reid murals on the ceiling of the rotunda. From 1934 to 1942 the exhibition hall was home to eighteen lighted tennis courts. During World War II it was requisitioned by the military for storage of trucks and jeeps. At the end of the war, when the United Nations was created in San Francisco, limousines used by the world's statesmen came from a motor pool there. From 1947 on the hall was put to various uses: as a city Park Department warehouse; as a telephone book distribution center; as a flag and tent storage depot; and even as temporary Fire Department headquarters. One of only a few surviving structures from the Exposition, it is still situated on its original site. It was rebuilt in 1965, and renovation of the lagoon, walkways, and a seismic retrofit were completed in early 2009.